Liquids also experience surface tension. So, here, surface tension is also defined as a contractive tendency of the surface of a liquid that allows it to resist an external force. It may also be defined as a property of liquid by virtue of which the surface of a liquid at rest tends to have minimum area and behaves like it is covered by a stretched membrane. The molecules of the liquid experience intermolecular attractions, or cohesive forces, which means the molecules are pulling and pushing away from each other, just like magnets both attract and repel each other. In the case of a water molecule surrounded on all sides by other water molecules, every pulling force is balanced by a pushing force. The net force is zero. Though at the surface, where air and water meet, that is not true. The water molecules at the surface experience a net downward pull. This is the surface tension of the water. Surface tension is broadly defined as the energy required to increase the surface area by a unit amount. Water molecules like to interact with each other because they are polar molecules, meaning they have positively and negatively charged sides. Similar to a group of magnets, the water molecules arrange themselves so that the positive sides are away from each other, but can interact with the negative sides. Other polar molecules also interact with water molecules. Molecules that interact with, and are dissolved by water are called hydrophilic molecules. There are also molecules that do not like to interact with water. They are hydrophobic. If a molecule that has both hydrophilic and hydrophobic parts is added to water, the hydrophilic end will try to get close to the water molecules while the hydrophilic end will push away from the water. This pulling and pushing separates the water molecules from each other and decreases the surface tension because of this. Compounds that lower the surface tension of water are known as surfactants. •	Water beading on a leaf. •	Water striders stay atop the liquid because of surface tension. •	Water dripping from a tap. •	Flotation of objects denser than water occurs when the object is non-wettable and its weight is small enough to be borne by the forces arising from surface tension. •	Tears of wine formed on a wine glass. The Marangoni effect is the mass transfer along an interface between two fluids due to surface tension gradient. Since a liquid with a high surface tension pulls more strongly on the surrounding liquid than one with a low surface tension, the presence of a gradient in surface tension will naturally cause the liquid to flow away from regions of low surface tension. The surface tension gradient can be caused by concentration gradient or by a temperature gradient (surface tension is a function of temperature). A region with a lower concentration of a liquid ‘A’ with greater surface tension will pull on the surrounding fluid ‘B’ more strongly than a region with a higher liquid concentration which has lower surface tension. The result is that the liquid ‘A’ tends to flow away from regions with higher concentration of ‘B’—along the tension gradient. This can also be easily demonstrated by spreading a thin film of water on a smooth surface and then allowing a drop of alcohol to fall on the center of the film. The liquid will rush out of the region where the drop of alcohol fell. o	It should be large enough that the raft can travel a short distance within it. o	Make sure it can be easily emptied, as you will be filling and re-filling it with fresh water often. 1. Cut the sponge into at least 10 small, identically sized pieces (cubes of side 1.5cm). The sponge will fit into a space cut in the back of the raft. 2. Make a rough shape of the raft on the transparencies. a. The raft should be symmetric. b. The raft should be small enough that it can travel a short distance in the basin or sink, but still be large enough to hold the sponge piece. 1. An initial size of 7-13 cm long, and a width that is approximately half of the length was taken. 2. The size of the raft was noted in a notebook. c.	A space in the back of the raft was cut. The sponge will fit here. It should be slightly larger than one of the sponge pieces. 3. The raft was cut out. 4. 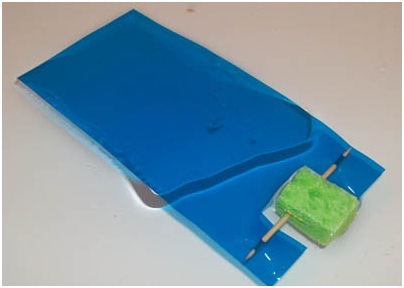 Run a toothpick horizontally through one of the small sponge pieces so enough of the two ends of the toothpick can rest on the transparency, then attach the toothpick ends with tape so that the sponge is attached to the small space at the back of the raft. 5. Fill a large basin or sink with tap water. 6. Put the raft onto the water surface and let it float. 7. Using an eye dropper, put a drop of liquid laundry detergent onto the sponge at the end of the raft. If one drop is not enough, put one or two more. The raft does not require much detergent to start moving. 8. Observe the motion. Record all observations in the notebook. 9. Empty the basin or sink. Also rinse the raft, especially the sponge piece, to get all of the detergent off of it. 10. Repeat steps 5-9 with the same raft and sponge at least two more times. 11. Replace the sponge on the raft with a fresh sponge. 12. Fill up the basin or sink with fresh water. 13. Put the raft onto the water surface and let it float. 14. Put a drop of liquid hand soap onto the sponge at the end of the raft. 15. 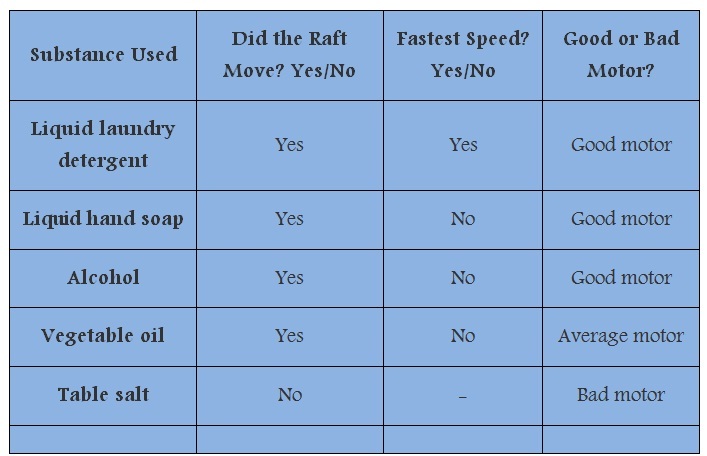 Observe the motion and compare it to the first raft, which used detergent. 16. Repeat the above steps with rest of the materials to be tested.